Even though we stopped moving for only a day and a half, it was a refreshing pause. Not that we didn’t have some excitement. Jack decided to go chasing after something in the forest and we ended up losing him for a little bit until my grandma saw him strolling along the side of the road going who knows where. I also helped my grandpa take the dock out of the water for the winter. It was a grey and drizzly kind of day which is probably for the best since I had to be home. I could either do two long days of driving which would get me home with a day before work or three days which would give me no down time. Then there was the decision of the route. I usually go north which takes me along the north shore of Lake Superior instead of the south route that takes me back into the U.S. The map said that the south route would be three hours shorter so I decided to go that way. It rained almost all day long. 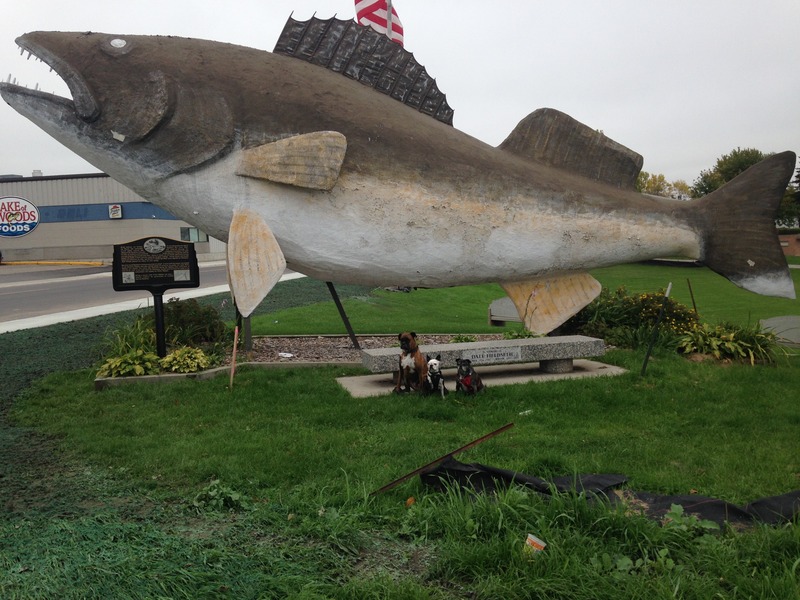 It did break for a little while in Baudette, Minnesota which is where we found Willie Walleye. That thing is horrifying. But Cafe X was within walking distance so we were able to stretch our legs while I caffeinated for the drive. As it was getting late, I passed by campgrounds thinking that there’ll be more coming up. You would think by now that I would know better and would stop as soon as I realized it was getting dark. But there’s always that drive to get further down the road before stopping. With patchy cell service, it was also hard to find places to stay in case camping wasn’t an option. And then the deer came out. It’s funny: I hadn’t seen any deer at home for ages but in a short stretch of road, I saw lots. After the third deer ran across the road in front of me, I decided that discretion was the better part of valour and pulled over into a rest area. I was hoping that there would be a campground close by but no such luck. At least it was warmer than it had been in Idaho. I took the dogs for a walk and poured them some food and water which they promptly ignored. I fluffed up their blankets and climbed under one for me, draping it over my feet just as Jack jumped onto my belly and somehow wedged himself under the steering wheel when I tipped my seat back. Piper stayed in the back seat and rested her chin next to my ear which is as adorable as it is irritating. Yes she’s a snuggler but you try having a boxer sigh in your ear all night long. Leo piled up the blankets and nested in the front seat and the back seat, hopping from one to the other. Small price to pay to not run over Bambi. 1 response to "Heading Home"